A large Iron Age hillfort that may have served as a tribal centre for the Silures. Llanmelin Wood was built around 150 BCE. Its size suggests that it was a centre of great importance. One possibility is that it was the immediate predecessor of nearby Caerwent, built by the Romans shortly after their conquest of southern Wales. The large site, now almost overwhelmed by woodland, is ringed by multiple series of bank and ditch defences. Excavations suggest that the fort developed in several stages. The initial stage, in the 3rd century BCE, was a small fort encircled by a single bank and ditch. Around AD 50 the entrance was rebuilt and strengthened, and timber palisades and platforms were constructed on top of the banks. Several 'annexes' were built to the east of the fort; small enclosures possibly used as animal corrals. The fort was finally abandoned around AD 75. Excavation within the enclosure has turned up Iron Age pottery, bones, and metalwork, as well as later Roman pottery. 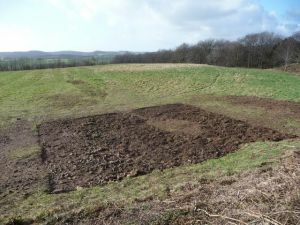 The Roman finds suggest that the fort may have been adapted as a farm after the Roman conquest. Exposed stone foundations are evidence of later medieval buildings on the site.